You may have heard about Your Time For Creative Empowerment, Inc. and asked what they were all about. You have a chance to find out by attending their first major fundraising gala and wearable art presentation. 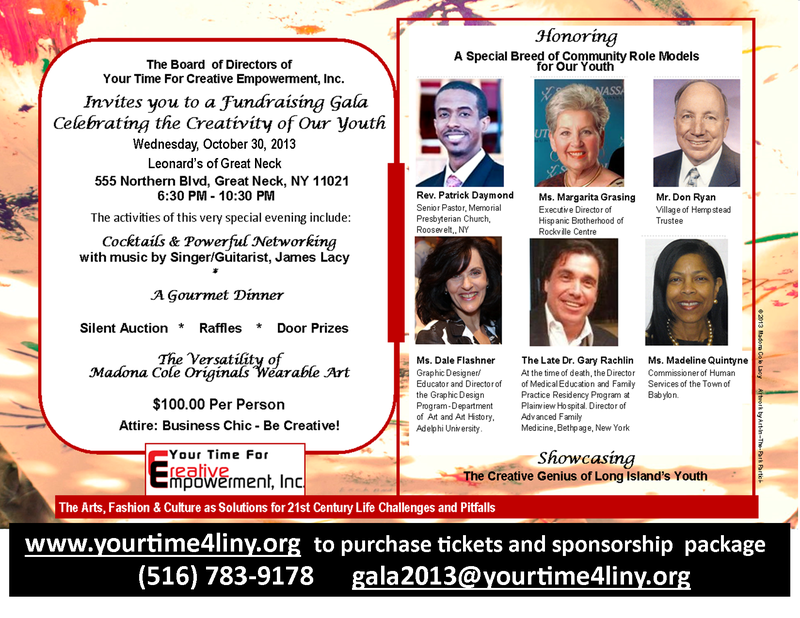 Your Time For Creative Empowerment, Inc., a New York State registered non-profit organization, will launch its 1st major fundraising gala, on Wednesday, October 30, 2013, at Leonard’s of Great Neck, 555 Northern Blvd., Great Neck, New York. As part of the activities of the evening, awards will be presented to: Professor Dale Flashner, of Adelphi University and originator of ‘Creative Cups’ * Madeline Quintyne, Commissioner of Human Services of the Town of Babylon * Rev. Patrick Daymond, Senior Pastor of Memorial Presbyterian Church and originator of the “Barbershop Rap Mentoring Program” * Don Ryan, Village of Hempstead Trustee who coaches basketball teams for Hempstead Dons, Inc. * Margarita Grasing, Executive Director of Hispanic Brotherhood of Rockville Centre with over 34 years of service to the Hispanic community of Long Island * Posthumously, Dr. Gary Rachlin, who at the time of death, was the Director of Medical Education and Family Practice Residency Program at North shore Plainview Hospital and Director of Advanced Family Medicine, Bethpage as well as an avid supporter of community initiatives for Long Island’s youth. Other highlights include: showcasing the creative talent of Long Island’s youth, a wearable art presentation by Madona Cole Originals, cocktail hour live music by Jim Lacy and guests, raffles, door prizes. As we enter 2013 with great expectations that everything we touch will turn into gold, and that all that we wish for will be manifested tenfold, we pray that we can muster the courage, strength and determination to position ourselves within the space of the brand new year to fully experience a Happy New Year. Our wish for you is that you find a way to totally embrace the spirit of love, joy, peace, patience, kindness, goodness, faithfulness, gentleness and self-control in all that you see, you think, you feel and do. In 2013, we are looking forward to increasing our Madona Cole Originals Free Dignity Enhancement service and expanding our collection of hand-crafted head wear and accessories. Through this service, we pride ourselves with addressing the fashion needs of all women and girls, with a special focus on those who are hospitalized or experiencing hair-loss as a result of chemotherapy and alopecia. We will continue to provide My Time Has Come solid art-related social and cultural enrichment workshops on a consultancy basis for libraries, schools and community organizations. As we work towards providing Long Island youth and parents with tools for navigating the challenges of life in the 21st Century, we invite you to support the efforts of the newly established non-profit organization, Your Time For Creative Empowerment, Inc., in your own way.